The year was 1880. Rutherford B. Hayes, the nineteenth President, sat in the White House; South of the border Mexican soldiers ambushed and killed the great Apache military strategist, Chief Victorio, who had earlier attacked settlers in New Mexico territory. Born that year were Tom Mix, Mack Sennett, Douglas MacArthur, W.C. Fields, Helen Keller and H.L. Mencken. On February 9, the Atchison, Topeka and Santa Fe Railway Company pulled its first train into the Santa Fe, New Mexico depot, its arrival celebrated by colorful speeches and a grand parade. With that train, the treacherous journey by horseback, covered wagon or stage coach on the rutted old Santa Fe Trail came to an end, and an era of economic and social change began that is still evident in the life of Santa Fe today. The railroad brought tourists and new residents in its sleeping and dining cars, along with the Harvey Girls on their way to the Harvey House-La Fonda Hotel on the Plaza. Artists hired by the rail line drew and photographed images of Santa Fe to entice faraway Easterners to come see the West. Local Native American and Hispanic arts and crafts were created to market to rail travelers. Building materials brought in on the rail, such as galvanized tin and bricks, added metal roofs and Victorian brick buildings to the pueblo style architecture of Santa Fe. New neighborhoods were created around the Railyard to house the workers and their families involved in the new rail economy. Santa Fe’s Railyard became a center of activity, its station a greeting place for visiting politicians and celebrities as well as the sentimental point of departure for many a young man or woman going off to war or school. Two standard gauge rail lines came into the city in addition to the narrow gauge Chili Line produce train; because Santa Fe was a terminus, a turntable was used to rotate engines. 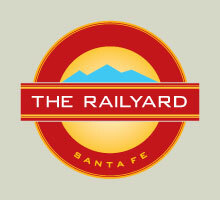 By the 1940’s The Railyard was an activity center for Santa Fe locals. Older neighbors still living next to the Railyard today, remember afternoons picking wild lettuce and swimming along the acequia that flows through the site. There was ice skating in the winter and elephants when the circus was in town. During the Depression, locals came to the Railyard to be given free meat from the warehouses. The site remained a central hub until rail transportation began to be eclipsed after World War Two by the interstate highway system and the airlines. Like other railroad-related locales around the U.S. Santa Fe’s station, tracks, equipment and surrounding neighborhood began to decline. By 1987 it was declared a blighted area requiring redevelopment; an overall city plan was begun the same year. The process took years, and involved hundreds of participants. The city made it clear from the beginning that it wanted adjacent neighborhoods to be protected even as the new project was to reflect the original rugged, industrial look of the old rail complex while at the same time provide local business opportunities. The public took part in the design process. In February, 2002 exactly 122 years to the month that the first train pulled into The City Different, the Railyard Master Plan was approved and the Santa Fe Railyard Community Corporation was awarded a lease and management agreement with the city to oversee development of the 50 acre site. Groundbreaking began with archaeological studies in 2004. Infrastructure construction began and development of building sites commenced in 2006. What the public experienced at the September 2008 Grand Opening celebration was nothing less than the rebirth of one of Santa Fe’s historic locations. Today, more than one hundred years later, the City of Santa Fe is the owner of the Railyard land, home to a vibrant mix of tenants serving the diverse interests of the community, from deeply rooted non-profits such as the Farmers Market, internationally renowned arts organization SITE Santa Fe, Hispanic cultural center El Museo Cultural and cutting edge teen art center Warehouse 21, to an eclectic mix of restaurants, performance art spaces, shops, contemporary art galleries and the cutting-edge 11-screen Violet Crown Cinema. With the arrival of the New Mexico Railrunner Express commuter service, trains once again regularly arrive and depart from the historic Santa Fe Depot, and 2017 will see the development of Railyard Flats, a 58-unit urban living project and the spectacular expansion of SITE Santa Fe by world-renowned SHOP Architects . Since its grand re-opening in September of 2008, The Railyard is once again not only the hub of contemporary life for Santa Feans, but also a new way to experience Santa Fe for its visitors from around the world.